There are some moviegoing experiences you vividly remember, even aside from what you thought aobut the movie. Seeing “Die Hard” in the summer of 1988 was one of them. I went with a couple of friends to see it at the old Continental in Denver, as a joke really, thinking we’d make fun of it in the way that teenage boys do. Come on, the guy from “Moonlighting” in an action movie? He looked ridiculous in the trailer. Should be good for a laugh, anyway. And, as we’re in the lobby, heading towards the theaters, we see the crowd from the previous screening letting out. In the midst of the throng is another friend of ours, Kevin. He sees us, and has this dazed look in his eyes. “Best action movie ever” he says fervently. Really? Couldn’t be. Of course, we undoubtedly had that same glazed happy look when we left the theater two hours later. And the “Die Hard” franchise was born. So, with AMC Star Cinema hosting an all-day “Die Hard” marathon today, and with the fifth installment in the franchise, “A Good Day To Die Hard,” opening Thursday, it seems like a good time to look back at the very eventful life of John McClane, terrorist magnet. A sequel is amost inevitably a step down, but it was clear right from the get-go that “Die Hard 2” would be a big step down. First off, William Sadler’s psychotic super-soldier is just no match for Alan Rickman’s Hans Gruber. Doing naked tai chi in your hotel room, then aiming your TV remote like a gun? That’s actually not scary at all, dude. Kind of lame, actually. The sudden deaths of innocents in the first “Die Hard” were genuinely shocking at the time, such as Gruber coldly executing Mr. Takagi. But Renny Harlin’s “Die Hard 2” just tried too hard to make its villains seem villainous, resulting in some gratuitous cruelty that really saps the fun out of the movie. How could anyone possibly think it would be a good idea to crash a planeload of innocent passengers — killing more people than were even in the original “Die Hard” — just to establish the bad guy’s bona fides? It’s a grievous miscalculation, as are the laborious attempts to fit in minor characters, like William Atherton’s slimy reporter, into the film somehow. For me, the “Die Hard” movies work best when they have a clear sense of their environment, that you have good guys and bad guys maneuvering within a defined space, an arena. What’s surprising about 1995’s “Die Hard with a Vengeance” is that “arena” is really all of New York City. But it still works because returning director John McTiernan uses the geography of Manhattan much as he did the top 5 floors of Nakatomi Plaza. If you’re a New Yorker, you know exactly where Bruce Willis and Samuel L. Jackson are at all times. One of my favorite moments is that pell-mell car ride down the length of Manhattan, when McClane not only thinks to call in a fake 911 call so he’ll have an ambulance to use “as a blocker,” but he knows which hospital to call, and how far the ambulance’s call area is. If there’s anything that today’s modern CGI action movies lack, it’s that sense of spatial grounding. Once you can use digital effects to show anything, from any angle, a director can sometimes forget about those parameters in a hunt for something that just looks cool. What’s funny is that, at the time, “Vengeance” was considered over-the-top, and for years Willis would insist that a fourth “Die Hard” would return to the original’s gritty roots, possibly with McClane using only his wits to survive bad guys in the South American jungle. So much for that. Which brings us to “Live Free or Die Hard.” The bad guy in this 2007 film (a miscast Timothy Olyphant) calls McClane a “Timex watch in a digital age,” which sums up both the problems with the fourth installment, but also its saving graces. Director Len Wiseman chases bigger, better, more implausible stunts at every turn — John McClane jumps on the wing of a fighter jet! John McClane knocks a helicopter out of the sky with a police car! — because that’s the way action movies are done now. The film rushes headlong from one setpiece to the next, one effect to the next. For minutes at a time, it could be any action movie. 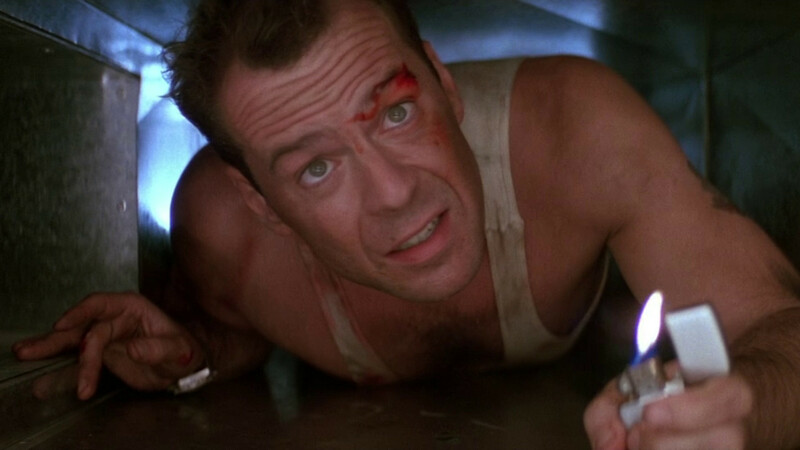 What saves it, and what makes it pretty fun, is Willis as McClane, still beaten and bedraggled as he was crawling through those air ducts almost 20 years earlier, still smirking away at all the mayhem around him. That the movie ends not with a big blockbuster climax, but with a quick, violent shootout, showed that the “Live Free” did keep its connection, however tenuous, to the series. Which brings us to “A Good Day to Die Hard,” which sends McClane to Moscow to battle a new army of baddies with his estranged son. The previews showcase big, implausible action that makes “Live Free” look like a modest little thriller, and now the fate of the world rests on his shoulders. It could be fun. But I can’t help but miss the guy crawling through the air ducts, the perfectly-wound Timex watch of action heroes.